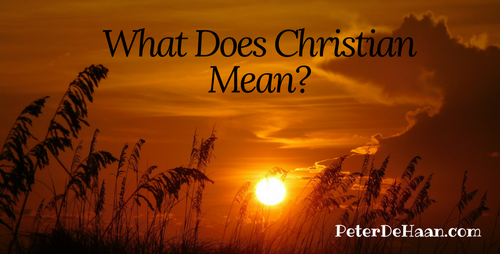 Explore the Christian label: What Does Christian Mean? I don’t like the label “Christian,” even though I am one. The Christian label is a loaded term. It means many things to different people. To some, Christian implies narrow-minded. To others, Christian means hateful. Still others think Christian refers to a political party or secular movement. And what about mean, militant, murdering, manipulative, and money mongering? Do you see why I don’t like the Christian label? And let’s not forget the inquisition, the crusades, slavery, segregation, and fighting abortion (I’m referring to blowing up clinics and killing doctors, in case you’ve forgotten). But most Christians aren’t like that, you plead. You’re right. We’re not, but I still don’t like the Christian label. I prefer “Jesus follower” instead. Read more in Peter DeHaan’s book How Big is Your Tent? A Call for Christian Unity, Tolerance, and Love. Get your free copy today and discover what the Bible says about following Jesus.